This reversible Kimono is made from a navy blue velvet fabric on one side and has a luxurious vintage art print on silk on the other side. The fine printed silk comes from an original painting of our collaborating artist “Papartus” to create a unique and mystique look. 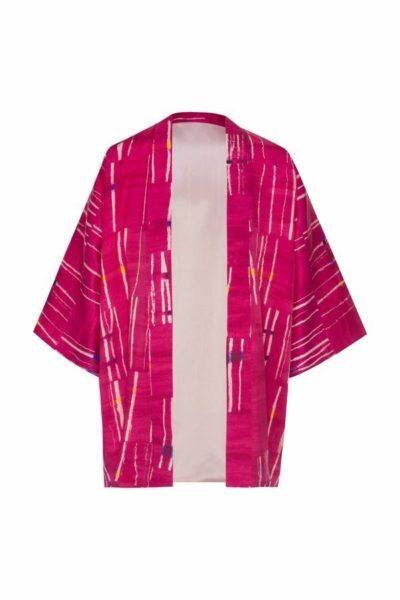 The mix between art and long kimono coat makes this kimono the most sophisticated and dared piece for this season. Simply slip into velvet high boots to complete a charmy and classy evening look. With a gold piping edge on the front and embroidered logo in the back, this long kimono coat will make you feel confident and unique.